I’m not big on making elaborate breakfasts. I generally keep it simple in the mornings, because need I remind you of the blueberry buckle (mostly averted) fiasco? Now that the weather is turning cooler, however, it’s nice to start the day with something a little more substantial than a slice of toast. I’m a huge potato lover, so of course I’ll jump at any excuse to eat them for breakfast. 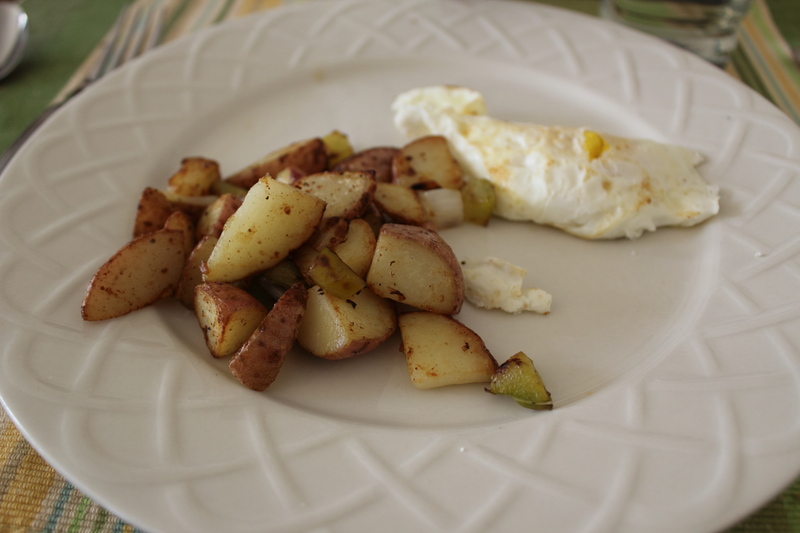 The best part about potato hash is the endless ability to customize it to your tastes. Want a Tex Mex kick? Add taco seasoning. Top with cheese or don’t! Add tomatoes or don’t! Anything on a based of fried potatoes is a winner in my book. For this version, I cut potatoes roughly into 1 inch wedges and fried them in some oil until they were nice and browned on all sides. Then I added green bell peppers and onions and cooked until thy were soft. A dash of salt and pepper later, breakfast was served! I’d suggest looking at this recipe if you’re really clueless on where to begin, but honestly, no recipe is needed.